At this time of year the mailbox is brimming with catalogues from all the various mail order sporting goods dealers. Each contains all the glittering new offerings, and I must admit I generally take the time to look through them. There are always new things, even if the old things did the job just fine. It seems that everything must be 'new and improved' in order to keep the consumer happy. It also seems that with each new improvement life gets a little more complicated. I have been writing material for publication for over 40 years, and I started out writing articles on a manual typewriter. Manual typewriters had no spell check, no automatic correction, and when you made an error you had to erase it by hand. If you removed the paper from the machine before you discovered your error you likely ended up typing the entire page over again. From manual machines I moved to an electric, but correction was still done by hand. Then they improved the electric models to provide for spell check, and a means to erase what you had typed by pressing a button. About the time they made typewriters into proficient machines they were suddenly replaced by word processors, and then computers. Each step up the ladder made the process a bit easier, but also more complex. Manual typewriters were very basic machines that went on for years without requiring anything more than a new ribbon every few thousand pages. The early electric models were equally simple, unless the power went out, but each successive model was more and more complicated. If your old manual model had a problem a local repairman could have it up in running in a very short time, but if an electric model went down it might have to be shipped to the factory. If it was more than a couple years old it was likely that no one had the parts to fix it. In the computer age God help you if your machine develops a problem or worse yet gets a virus, and like many modern machines new and improved models appear so fast that your latest desktop model is obsolete before you get it unpacked. With software and hardware glitches, printers that refuse to print, and power surges that wipe out several hours of work it would be a stretch of the imagination to declare that they have made life easier. It is with a similar suspicion that I look at all the new gadgets in the sporting goods catalogues, each one guaranteed to be an improvement over last years offering. Sometimes I wonder how it is possible to find something to improve when the original item was so very simple, and worked so well. 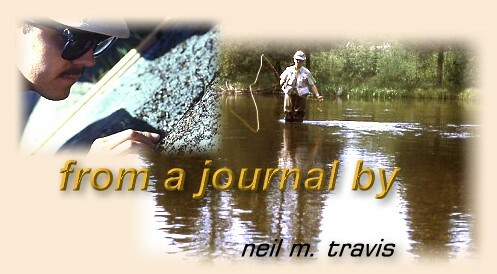 I have a closet full of fly rods that I have accumulated over the years. During my fly fishing career I have witnessed the progression from bamboo to fiberglass and from fiberglass to graphite, boron and now titanium. Modern fly rods made from man-made materials are generally lighter in weight than a comparable rod made of bamboo, however except for some very subtle and subjective nuances that are likely only to be noticed by a very small number of casters little has changed. To entice us to purchase a new rod they suggest that it will cast farther, the loop with be tighter, or it will be more accurate. With a bit of practice and maybe a few lessons from a qualified instructor most people can cast farther, have better loop control and be more accurate with the rod they currently own. Years ago when I taught fly casting classes we had a broom with guides taped on the handle, and with a little practice I discovered I could cast quite well with that old broom. It wasn't a joy to cast, and I certainly would not have wished to use it for fishing, but it proved a point. In the hands of an expert caster the latest fly rod might produce a slightly longer cast, or have slightly better loop control, but for the average angler these subtleties are negligible. My newest rod is over 10 years old, and some of the ones I use regularly are over 30 years old. Somehow I still manage to catch a fish or two on those antiques. The largest section of any angling catalogue is the section devoted to gadgets; clippers, retractors, magnifiers, fly boxes, and the like. Every year there are several new 'must have' gadgets that will make the anglers life easier. To accommodate all these must have items fly vests now have so many pockets am surprised that someone has not invented some type of electronic device to tell the angler what is in each pocket. By the time the angler looks through each pocket to find the item they are looking for it's likely they have either forgotten what they were looking for, or they no longer need it. Of course no fly fishing catalogue would be complete without several pages of flies. Although you will find some flies that are always listed, like the Royal Coachman, and the Adams there are always several pages of new or improved patterns. I am always amazed to notice that these new and/or improved patterns rarely show up in the next catalogue. It always seems that some newer or more improved model has replaced them. In the world of high-tech modern fly-fishing nothing is new for long. One other thing that is constantly changing in sporting goods catalogues, and especially in those dedicated to fly-fishing stuff is the price. All this new gadgetry is expensive. A vest with enough pockets to handle all the paraphernalia will set you back at least a hundred dollars, and by the time you buy all the fly boxes, clippers, hemostats, and other essential items you have dropped enough to make a good down payment on a car. Now you still have to buy a rod, reel, line, leaders, tippets, flies, waders, rain jacket, sunglasses, and hat. It you are thinking about buying a boat and trailer you had best make a trip to your friendly banker. I hope you have good credit. Perhaps I am just an old curmudgeon, but I still find that much of the old stuff still works just fine, and most of it is a lot less complex. I have several old fiberglass rods with metal reel seats that still cast a fly just as good as they did 30 years ago when they were new. All of my fly reels are single action models, with no fancy drag systems, but they still perform flawlessly after all these years. I like simple fur and feather flies, and most of the patterns I have in my boxes are old reliable flies that have been around for many, many years. Day in and day out they seem to allow me to catch as many fish as the guys with all the newest creations. Perhaps it's the results of growing old, but what always seemed to be so simple has now become so complicated. Walton said that angling was a contemplative sport, but today it seems to be the complicated one. From the waders on you feet to the vest on your back everything is high tech, new and improved, and just a bit more pricey than last year, and somehow it doesn't seem to last as long.